Jamaican sprint superstar Usain Bolt claimed yet another world record as he recorded a stunning victory in the 200m final at the World Championships. 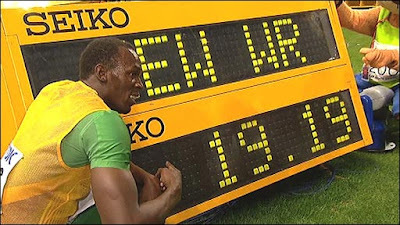 Bolt set a time of 19.19 seconds to demolish the previous record of 19.30 he set in winning Olympic gold last summer in Beijing. The 22-year-old finished well clear of the field, with silver medallist Alonso Edward finishing in 19.81. Wallace Spearmon of the United States took bronze. Bolt, who also smashed the 100m record in Berlin on Sunday, is now the first man to hold the 100 and 200m world and Olympic titles at the same time. After a nervy opening which saw Frenchman David Alerte false start, Bolt streaked off the blocks and took the lead within 20m. He put on the afterburners around the bend to leave the chasing pack trailing in his wake and after storming over the line, Bolt glanced down to the electronic display and pointed at his historic time. Earlier in the week Bolt had said he did not think a 200m record was on after missing a month of training earlier this year following a car crash in Jamaica. And after the 200m Bolt told BBC Sport: "I can definitely say I didn't expect that because I was a little bit tired. "I said let's try because people are really looking out for this, I said it won't hurt to try. So I tried really hard and now I'm really tired. "Maybe next time I should just run the 200m or the 100m alone. My form was going backwards. I wasn't running upright. It wasn't a good race but it was a fast one." Bolt, who completed his 200m win a day before his 23rd birthday, set three world records when winning his Olympic golds in Beijing last summer and his breathtaking performances in Berlin have enhanced his reputation as the best sprinter of all time. "I definitely showed people that my world records in Beijing were not a joke," he said. And Bolt said he is closing in on his aim of becoming a sprinter the world will never forget. "I keep telling you guys my aim is to become a legend," he added. "I don't think about records. I don't put myself under pressure. I know what to do and I go and execute. "I did well for myself and I am on my way to becoming a legend so I am just happy." America's Shawn Crawford, who finished fourth, admitted he was left in awe by Bolt's display. "Just coming out there, I'm just waiting for the lights to flash 'game over,' because I felt like I was in a video game," said Crawford. "That guy was moving - fast."